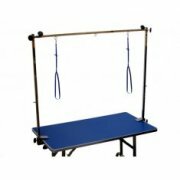 In this section of the splendid pets website you will find many different types of dog grooming tables for sale at some of the best prices in the UK. 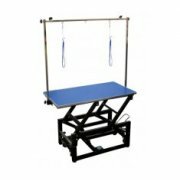 The standard static grooming tables we supply are regarded by most as one of the most stable and well priced grooming tables currently found in the UK market, we currently supply our range of static grooming tables to 90% of all UK championship dog shows, including Crufts, the biggest dog show on the planet. 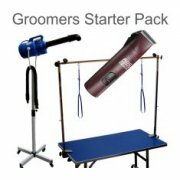 Also in this section you will find a range of grooming tables that were specifically built for use at dogs shows, this includes our incredibly popular lightweight ringside competition grooming table as well as our extremely well priced Trolley grooming table which will allow you to transport your dog and show paraphernalia easily to any dog show. Finishing off our range of dog grooming tables is our range of electric & hydraulic dog grooming tables, all of these tables have been manufactured using research from our many dog grooming stylists and are all equipped to handle many years of work in your busy dog grooming parlour. 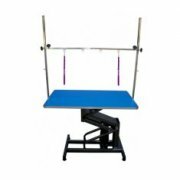 Emperor Grooming Tables BLUE - XL Emperor PRO Dog Grooming Table - 43"
Emperor Grooming Tables PINK - XL Emperor PRO Dog Grooming Table - 43"
Emperor Studio Electric Grooming Table - 48"